The Brain is the final boss of the co-op ScareScraper mode in Luigi's Mansion: Dark Moon. He is an unusually large Poltergeist who is fought atop the tower's roof. His attack pattern is very similar to Poltergeist variants, except that he has much higher HP than other Poltergeist variants and also has the ability to charge up a force field that he can project to knock away any Luigis that are vacuuming him (though this can be avoided by jumping when the force field is released). Unlike the other bosses in the ScareScraper, which are randomly chosen when the boss' floor is reached, The Brain is always fought when the roof is reached, and he has no texture-swapped variants like the other bosses. When defeated, fireworks shoot up in the sky behind the tower and the Luigi who defeated him's Poltergust releases a large amount of coins, bills, and Gold Bars. 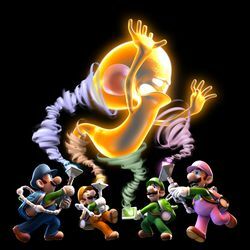 The Brain also appears in Luigi's Mansion Arcade, where he is the boss of Gloomy Manor. The Brain begins the battle with a shield, meaning he cannot be sucked up. The player can make the shield break by either sucking up the projectiles The Brain throws at Luigi or by clearing the ghosts he summons. If either of these methods are performed, The Brain can be sucked up for a bit before breaking free and repeating the attack process. Eventually, he turns invisible and can only be sucked up if the Dark-Light Device is used to reveal him. After The Brain loses 120 HP, it will be defeated. This cunning ghost is the most evolved of all the Poltergeists. He awaits ghost hunters who are both brave and smart enough to match his powers. This page was last edited on April 12, 2018, at 06:14.